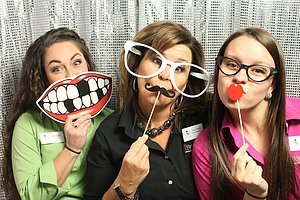 TMarie Photo Booth will preserve the laughs, the memories, priceless moments and hilarious antics of your special guests! While all events must come to an end, the delightful memories captured by T Marie Photo Booth will last a lifetime. Our friends and family had so much fun during our wedding reception! We are so happy that we invested in the photo booth for our wedding! We have memories that will last forever! We loved the scrapbook that was given to us on our wedding night! They help people mingle, meet others and have something fun to talk about and laugh about. Even your quiet and shy guests will likely have a good time acting a little silly in the booth. Photo strips are the ultimate event, party or wedding favor! Your guests will put them on their refrigerator and keep them there for many years, creating a lasting memory of your event. You'll include guests not included in the formal event pictures. It's FUN for all ages! Grandparents have just as much fun as children and young adults! Our selection of photo booth props will allow your guests to be creative and have lots of laughs! -Top quality keepsakes for every guest. -Photo Booth strips print out in less than 15 seconds on professional, smudge proof photo paper that will last for years. -We customize all photo strip designs and layouts for your event. You can add an event name, company logo or special graphics. Check out the different photo designs we've done for other clients. -A friendly, well trained photo booth attendant who will remain on-site for the full length of your event. -The complete setup and removal of the photo booth is complete by our attendants. - An online gallery and Facebook gallery of all pictures taken. - All digital images from your event are available on a flash drive or downloadable from drop box. We have 3 photo booth packages available and also can customize a package based on your event. Call us today at 319-721-8934 to book a super amazing photo booth experience for your event. If you are contemplating a photo booth rental for your event, party or wedding, T Marie Photo Booth is here to help you create a fantastic experience for your guests that they will enjoy and remember for many years to come. Contact us today and we can start talking about what you have in mind for your special occasion. Contract us at info@tmarieportraits.com.